This past weekend I was in Atlanta, GA working the Hot Chocolate 5K/15K Expo with my good buddy Dean Thompson. I was amazed at the size of this race. Nearly 25,000 people signed up to run a frigid January race for a hoodie and some hot chocolate. I think the folks at RAM Racing must be on to something? Anyway, this is the first expo that I have personally worked of this size. Friday morning we departed Dalton, GA at 5:00AM for the two-hour trek thru the big city of Atlanta to reach our destination, the GA World Congress Center. We got in, got set-up, and by 10:00AM people began arriving. 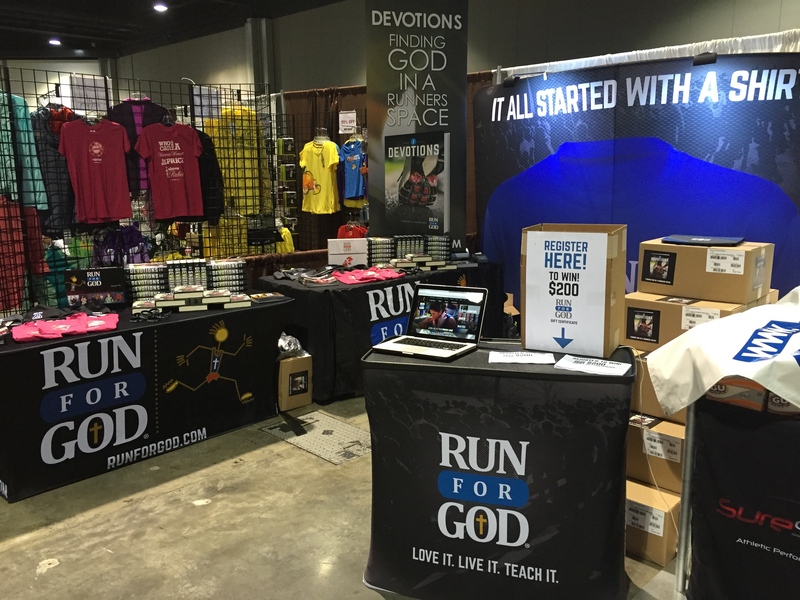 It wasn’t long at all before people started coming up to our booth and telling us how they had heard of Run for God. Some shared that they had or were currently going thru the class at their church. Others had never heard of Run for God and were excited to find out exactly what this ministry is all about. I would say that 98% of these nearly 25,000 runners were warm, accepting, or at least cordial. It’s those remaining 2% that I’d like to focus on for just a moment. You see, occasionally I would notice those who were obviously offended by our very presence. I could see this, because those who are offended are not usually very discreet about that fact. Some would walk out of their way to go around our booth to avoid us. Some would pass by our booth not paying attention until one of us would say, “Hello”, then they’d just keep walking and shaking their head. Others would walk up and just stare at our booth in disgust almost daring us to engage in some kind of debate. Like I said 98% of the crowd were simply awesome, and only 2% or less were, well, let’s just say “Not so welcoming”. You would think that those 98% would just drown out the eye rolls, whispers, and the standoffish body language of that small 2%. Well, at least for me, it didn’t. I began to find myself getting discouraged and even somewhat ill at those who did not agree with what Run for God stands for. Outwardly, I never let that show, but inwardly I was fighting a pretty serious battle. It was almost as if those people were there to test my spirit, to take my focus off what was important, and that was to point people to Jesus Christ. I never lost my composure because I knew coming in to this weekend that it would be like this. I also knew that there were those around me who don’t have a relationship with Christ and I could either shine the light of Christ or allow my “flesh” to take over. I’ll be honest, on the drive home Saturday night, I was physically exhausted from standing on a concrete floor for two days, but I was even more mentally exhausted from the spiritual battle that had taken place in my mind over the past two days. It’s times like this that your mind starts to wonder. You may even start to second guess what your doing. Am I on the right path? Am I really the person for this? Is what I’m doing really making a difference? Needless to say, it didn’t take long once my head hit the pillow to be out for the night. The next morning I wake up to the sound of my two overly active kids sprinting thru the house. It’s Sunday and time to head to church. Those thoughts from the drive home still lingering in my head, but they almost seem like a dream at this point. Isn’t it funny how God will start to wash away those kinds of thoughts so that he can prepare you for something else? And preparing me for something else is exactly what He was doing. I walked into Sunday school just as our class was getting started and it didn’t take long until I realized that this lesson was just for me, at least that’s how it seemed. Sunday’s lesson was taken from Nehemiah 6. This chapter is all about the conspiracy against Nehemiah. See, God had called Nehemiah to rebuild the walls of Jerusalem. Nehemiah had many supporting and helping him, but there were also those who wanted to harm and even destroy him. Chapter 6 talks about two men by the names of Sanballat and Geshem who were trying to distract and destroy Nehemiah. They would send letters to Nehemiah requesting a meeting and spread rumors about what he was doing. But he knew that this was only a distraction from what God had called him to do. Nehemiah knew what God had called him to do. He kept his focus and got the job done without being led astray or discouraged by distractions. Nehemiah was blessed! The Bible is full of stories just like Nehemiah’s. Stories of those who took on the call of God, worked thru adversity, and went down in history as a soldier of Christ. At the end of the day, we are ALL called to be the next Nehemiah. Followers who will run the path that God has laid in front of us, and lay aside the sin and distractions that make us lose our focus. Sounds like a passage of scripture that we runners all know. So let me encourage you today of the fact that if you are facing opposition while trying to advance God’s kingdom, then you are most likely exactly where God wants you to be. Don’t lose focus. Keep your eye on what God has called you to do. And prayerfully walk right thru whatever is being thrown your way! Thanks for your reflection. I’m in seminary and usually get a similar response. Most people are, at the very least, cordial about it, but there are always a few people who are totally turned off by just knowing they’re talking to a future pastor. You do good work! Keep it up and don’t let the 2% stop you from doing what you’re called to do!